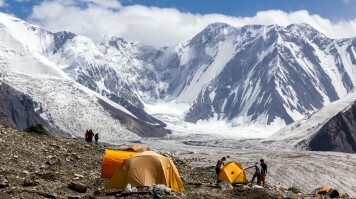 Explore two base camps in Kanchenjunga: Makalu and Everest. Trek to Pangpema base camp at 5100m. Discover different local ethnic communities such as Rai and Limbu. Looming Mountain Kanchenjunga (8,586m) the third highest mountain in the world..
Chortens temples and prayer walls - Traditional Sherpa Village. Explore the Kanchenjunga Base Camp and Yalung Ri Base Camp. The native Nepali communities such as Sherpa, Limbu, Rai and Gurung etc..
Great views of Kanchenjunga, the 3rd highest mountain in the world. Challenge yourself on this long, once-in-a-lifetime trek. Kanchenjunga is the starting trek for The Great Himalayan Trail. See Tibetan refugee settlements camp, along with ethnic group of Nepal like the Sherpas. Magnificient views of mountains including Everest, Kanchejunga and Makalu. Explore Kachenjunga base camp and cross Mirgin La Pass at 4,480 meters. Witness a diverse mix of different cultures of Nepal..
Get to see a huge variety of wild animals, including different kinds of birds, deers..
Embark on the first stage of the famed Great Himalaya Trail. 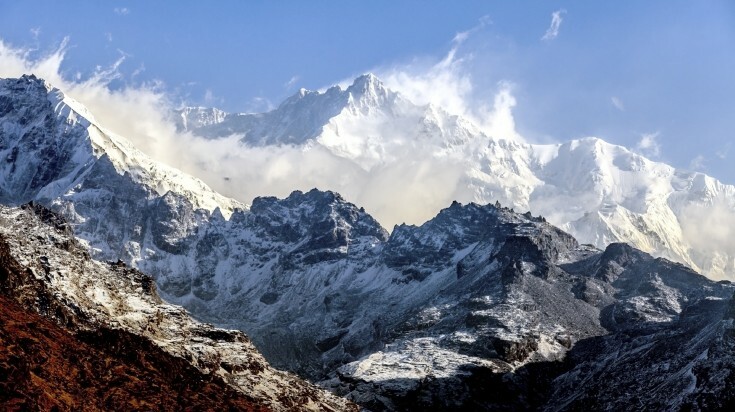 Marvel at the stunning views of the immense north face of Kanchenjunga. Immerse yourself in Limbu, Sherpa and Rai cultures. Witness unsurpassed views of the Kangchenjunga massif, Makalu range and surrounding peaks including Jannu. Embark on a challenging traverse through a region seldom visited by trekkers. Follow the glacial torrent of the Tamur and Ghunsa Rivers to their source on the north west side of the Kangchenjunga Himal. 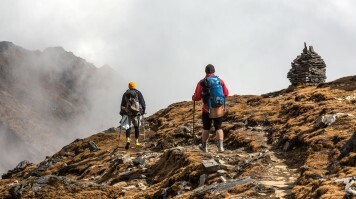 “We had this Kanchenjunga trek here in Nepal with a team of 7 group member in this month of October, this trek was very unique with all the greenery, mountains,Himalayas,Nature and wilderness. This trek provided us the great views of the Himalayan ranges of Kanchenjunga from both Base Camp North and South in this Kanchenjunga Circuit Trek, we saw many Flora and Fauna with different types of rhododendrons,plants,animals like musk deer,Blue sheep,Red Panda one of the rarest Panda of the world.This region contains many culture boundaries with different culture and religion, we also visit the one of the popular tourist sites Illam in this trek which is located between the India and Nepal boarder and this is also one of the biggest business hub of Nepal with tea garden and other herbs and products. If you are looking for a truly remote and adventurous trekking experience, then the Kanchenjunga trek is right trek for you! 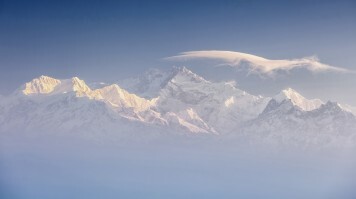 With its 8,586 m, Kanchenjunga is the world’s 3rd highest mountain, after K2 and Mount Everest. To the locals Kanchenjunga is not any mountain, but the abode of gods who bestow prosperity and goodwill. 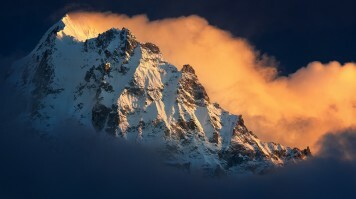 Kanchenjunga is situated in far Eastern Nepal and lies within the 2,035 square kilometers Kanchenjunga Conservation Area. This part of Nepal has never been densely populated and neither has it ever received many trekking tourists. The area is therefore an absolute haven for many rare Himalayan species, including snow leopards, red pandas, and blue sheep. This trek delivers true pristine landscapes. Via the 5,160 m Lapsang La pass the 4 week trek will take you through both the northern and southern base camp of Kanchenjunga. On the entire trail there will be stunning and remote mountain terrain because in addition to the Kanchenjunga peak, four subsidiary summits exceed 8000 m and more than some twenty peaks exceed 7,000 m.
Day 01: Flight from Kathmandu to Biratnagar - 81 m - and if available, flight from Biratnagar to Suketar. If no flights are available to Suketar we will take a bus to Phidim and spend the night there. This is a high altitude trek and therefore careful acclimatisation is needed. 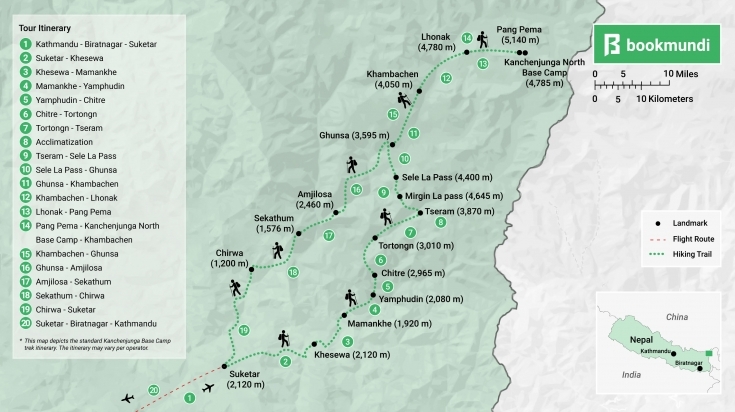 Most of the Kanchenjunga trekking is done in +4,000 m and without guest houses nearby. Please therefore be sure to bring enough warm clothes, especially during winter season (mid Nov - mid Feb). Your selected trekking agency will brief you in greater detail about this.